There are people who vacation to “get away from it all” and do mean it quite seriously. No reminders of things at home like television, music, or the internet. And then there are people like me who do want get away, but not from everything. I still want my entertainment and to be connected to the world while in the Maldives. Having just been awarded by Spain Conde Nast Traveller as Best International Hotel , NIYAMA Maldives perfectly understands the concept of modern luxury. And this is why I’m excited to show how one can truly ‘have it all’ in paradise, where modern design and comforts meet the wonders of nature. 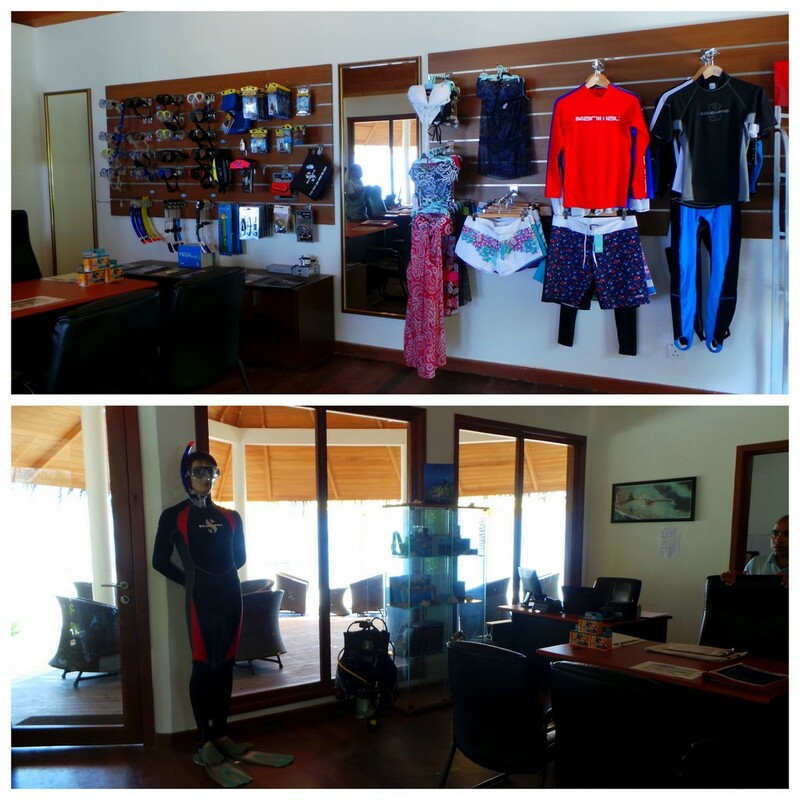 I have written a FULL review of the NIYAMA Airport Lounge if you would like to see it in detail. We departed around 4:30pm, so we had a lovely sunset arrival in NIYAMA. As soon as our seaplane landed on water (this still sounds funny to me), we could see the delegation of welcome party for arriving guests. 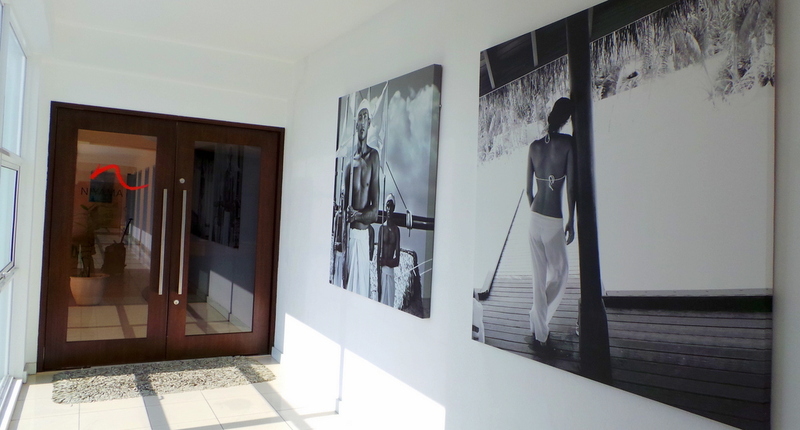 It consisted of the Management team, and respective villa hosts for every individual room. We were all greeted very warmly (think: presidential line-up introductions but more chillaxed and much more warmth), given drinks and cool towels. Soon, a young lady introduced herself to us as Evelyn, and she was to be our personal villa host for our entire stay. We hopped on a buggy with Evelyn driving, and she gave a very quick tour of the grounds while on the way to our room. I did mention that we arrived at sunset right? This was the view we had while heading to our room. At 200 sqm, I can definitely describe the studio as the perfect modern man’s playground..and more. 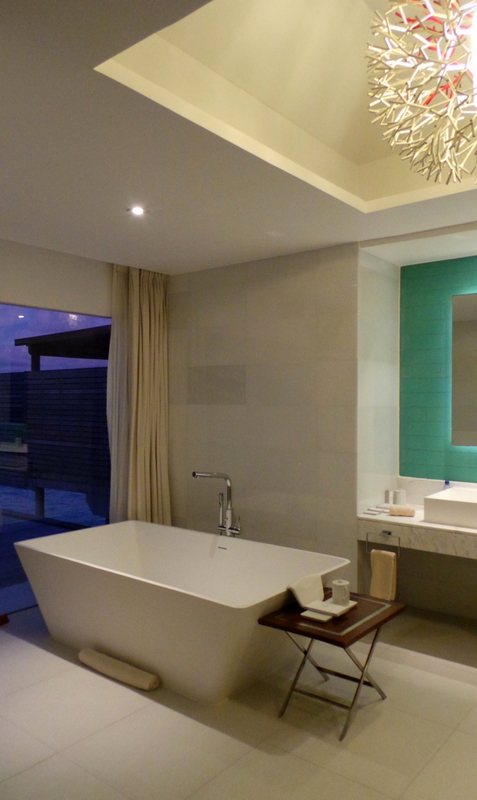 The King sized bed faces the balcony opening up to a private pool with jacuzzi, and the Indian Ocean. I spent many , many hours in this sofabed next to the pool. 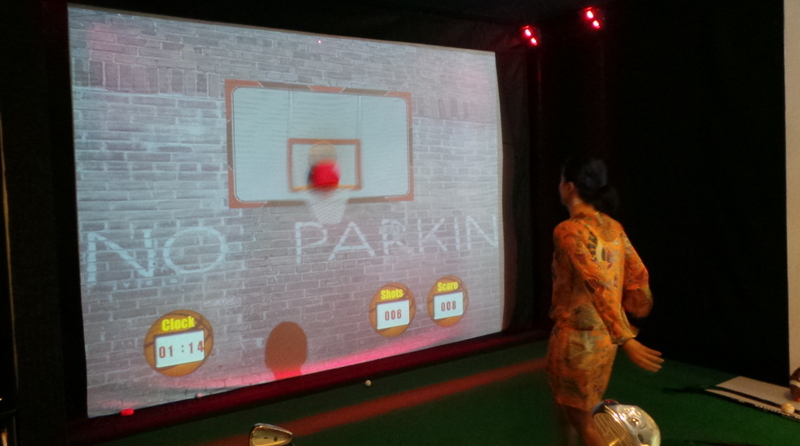 The following morning, I discovered the room’s entertainment system. There was a HUGE library of movies and music, and I played Gipsy Kings in surround sound, had the balcony doors open and just lay on the pool sofa with a tub of ice cream. Such bliss that morning was! 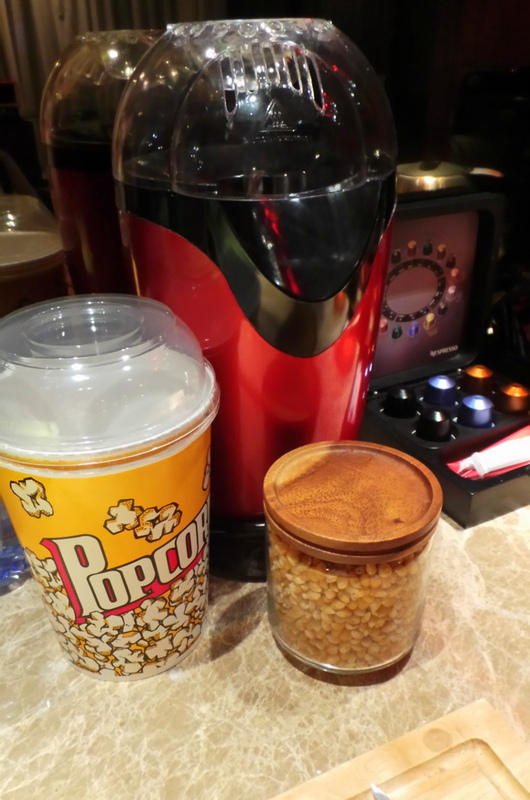 They have the latest movies, tv shows and music complimentary and on-demand. It was so hard to choose a film but I did see The Butler one evening. This is part of the Deli In experience in the room, where the mini-bar doesn’t just come with your normal tea and coffee-making facilities, but a popcorn maker with popcorn seeds refilled every night, and also complimentary ice cream in the fridge (which is a standing full sized fridge, btw), and also a serving of cassava chips every morning. There’s also an Ipad in every room where you can check all the scheduled activities in the resort, and also have ideas what to do / where to eat. 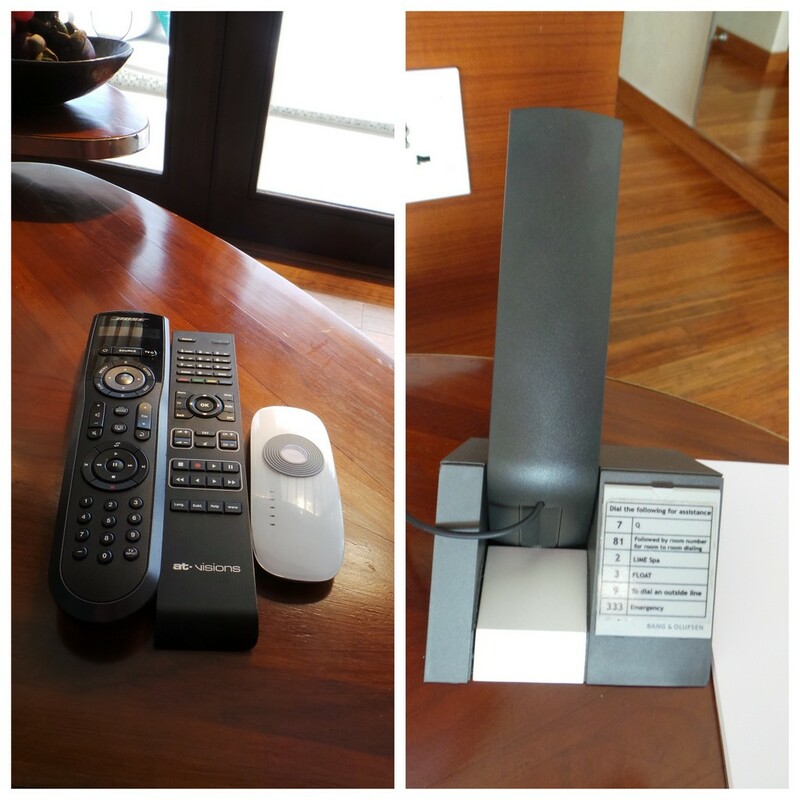 Almost everything is remote-controlled in the room, including the balcony curtain, and even the phone is sleek and very tiny. 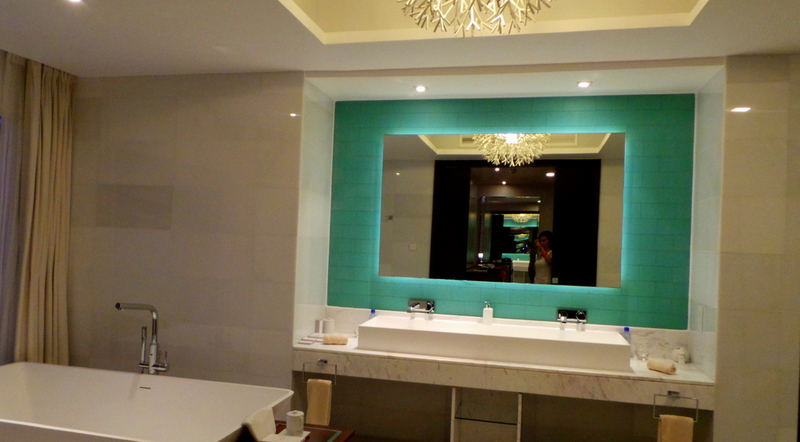 Consistent with the modern / minimalist style, the bathroom is quite spacious, with a stand alone tub that overlooks the sea , a coral chandelier, and a Tiffany-shade turquoise mirror. The separate shower and toilet are on the opposite end to the bath and the floors overlook the water. I’m very thrilled that the toiletries are from REN, a brand that I absolutely love. I normally bring my own shampoos, conditioner and lotion but for our stay here, I happily used up what was provided in the room. I first started using REN when I discovered their No.1 Purity Cleansing Balm and since then explored their other facial and body care line. Extra extra plus points to NIYAMA for their choice of toiletry brand. 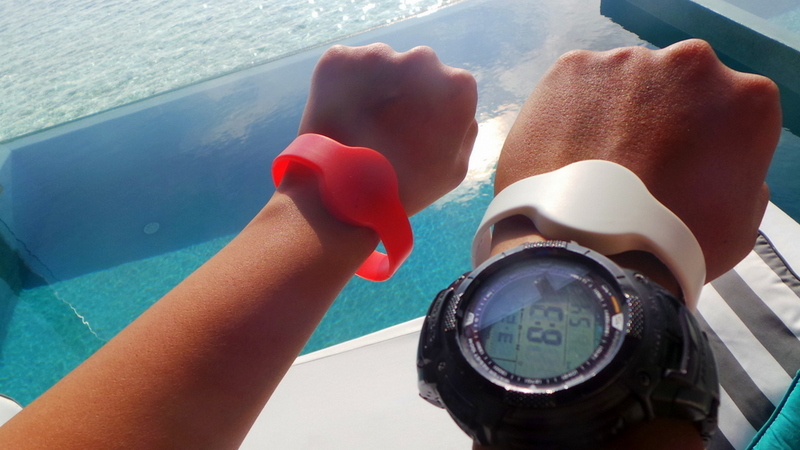 Waterproof wristbands that you just swipe in and out of the room. Very practical and thoughtful of NIYAMA. No more losing or misplacing your key card, especially when you’re out swimming! 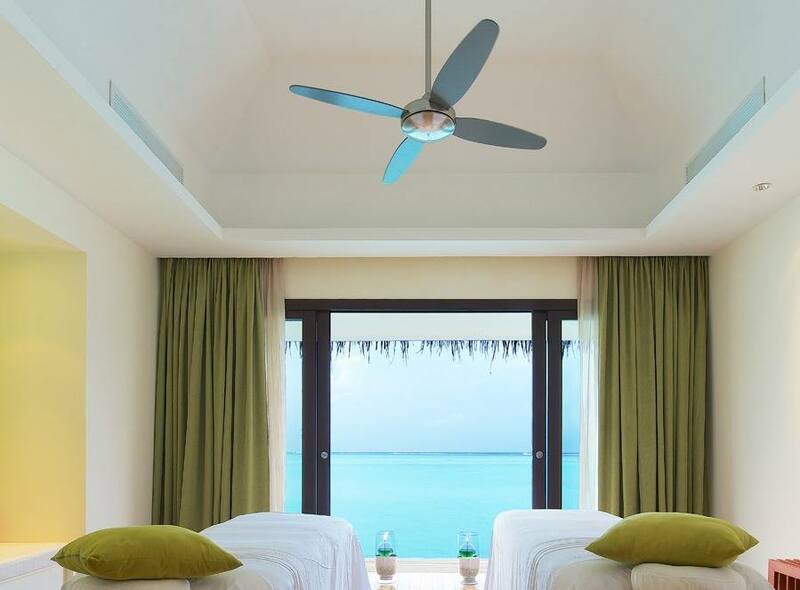 I was booked for a Signature LIME Spa Massage at NIYAMA Maldives’ LIME Spa. 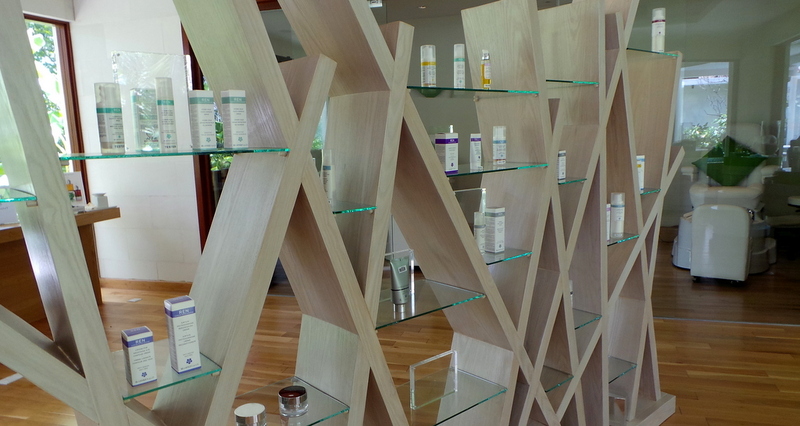 The spa is located in a lush garden setting, and I was given lime sorbet prior to the treatment. Visibility was very good and Zombie described it as one of the calmest drift dives he’s ever had. 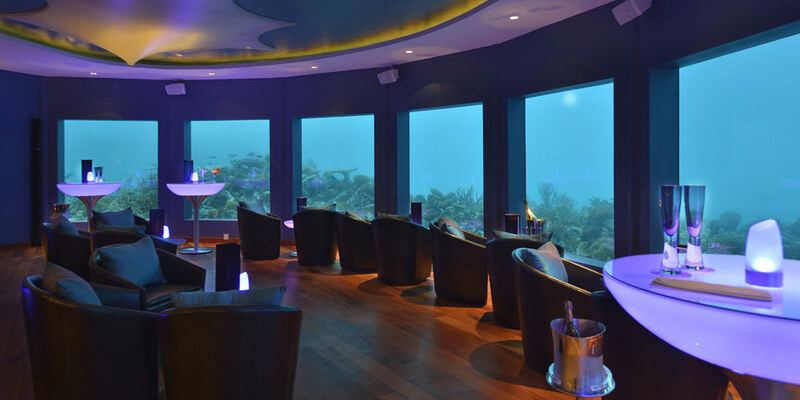 When in NIYAMA, it is a must to visit Subsix, the world’s first underwater nightclub. 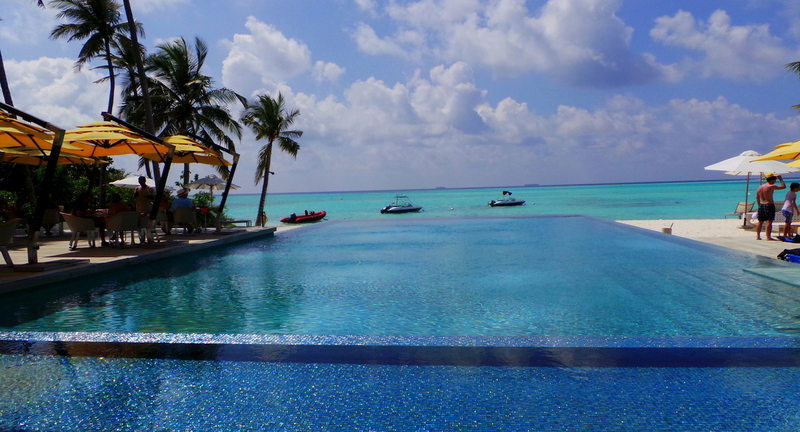 Located 50 metres from the main resort, NIYAMA offers chartered speedboat transfers. I have written a FULL review of NIYAMA’s Subsix here if you would like to view it in more detail. Epicure is an all-day dining that offers international buffet and ala carte choices. Every night they have a food theme and on our first dinner, the theme was Asian so we were really spoilt with a lot of sushi, seafood, and even pizzas. The location of Epicure is just next to the resort’s infinity pool, and during the day, the view makes it worth staying longer at your table and ordering seconds. 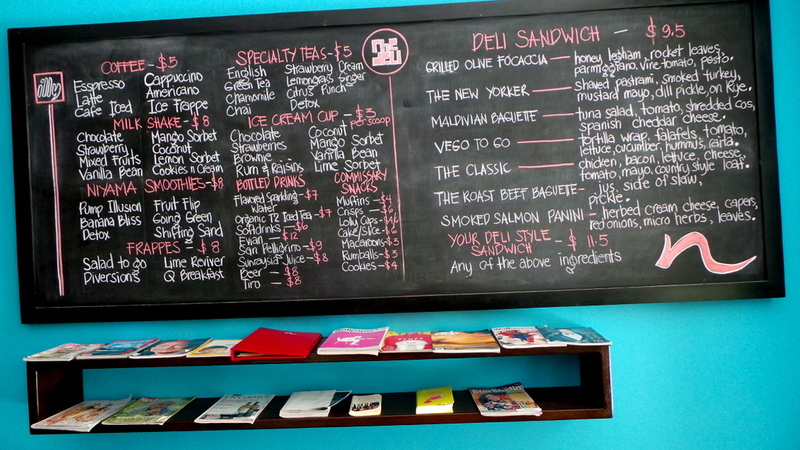 When it’s not quite lunch or dinner time and you feel like a snack in -between, there’s The Deli. 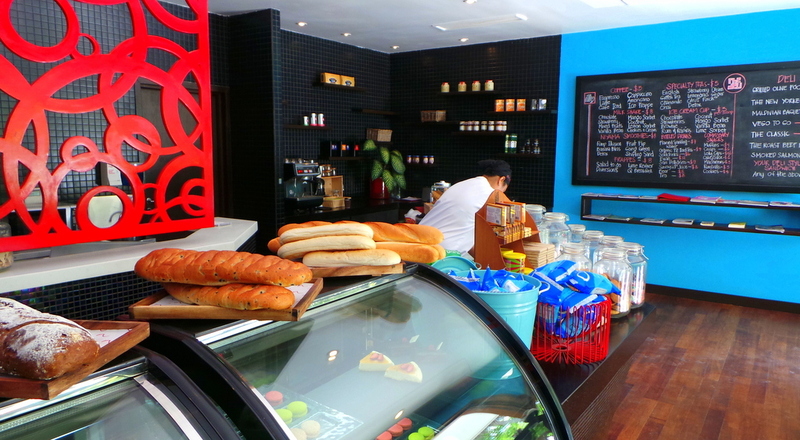 Grilled sandwiches, espressos, lattes – The Deli offers your usual city comforts while in the Maldives. Tribal is NIYAMA’s specialty dining restaurant. Open only for dinner, this again is a showcase of how NIYAMA has mastered the art of combining elements perfectly. 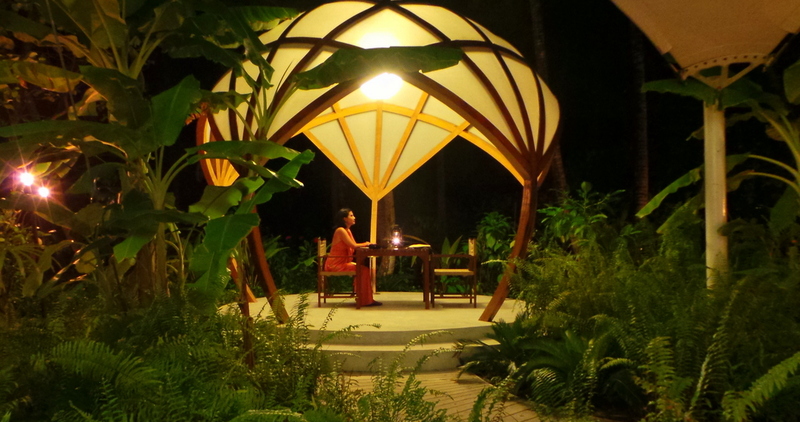 While this is the resort’s formal dining option, it also has an innovative campfire theme. To me, this is ‘glamping’ in the dining sense. Open dining, with a feeling of being in the bush yet having this almost whimsical Safari lodge setting . Serving South American and African dishes, we indulged in a lot of seafood, and also abit of meats and vegetables. If you like a lot of heat and spice in your food, Tribal is the place of dining for you in NIYAMA. This is truly one of my memorable dining experience in the Maldives, and would highly recommend booking a table in Tribal when you are checked in at NIYAMA. Now it isn’t all about consuming food in NIYAMA (though I don’t see anything wrong with that!). 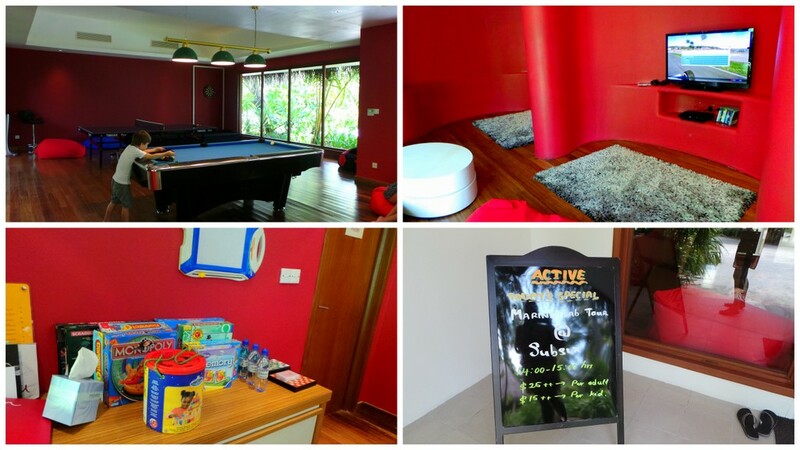 To make more room for the wonderful food, there’s PUMP, the resort gym that also offers classes. And then there’s ACTIVE, which served as playground for Zombie and I one afternoon. 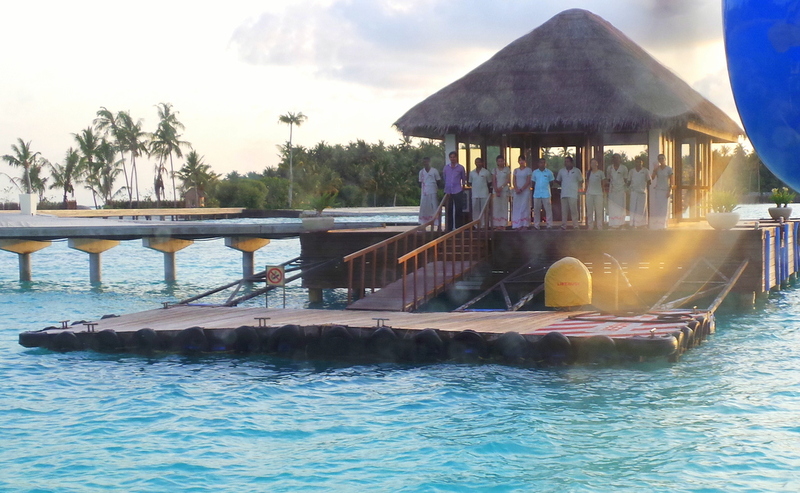 It’s worth noting that the staff of NIYAMA are also consistent with the resort’s brand – Young, hip, friendly, and overall enthusiastic to help. Even before I physically arrived at the resort, the email correspondence have been warm and friendly. More so when we stepped foot in the resort. 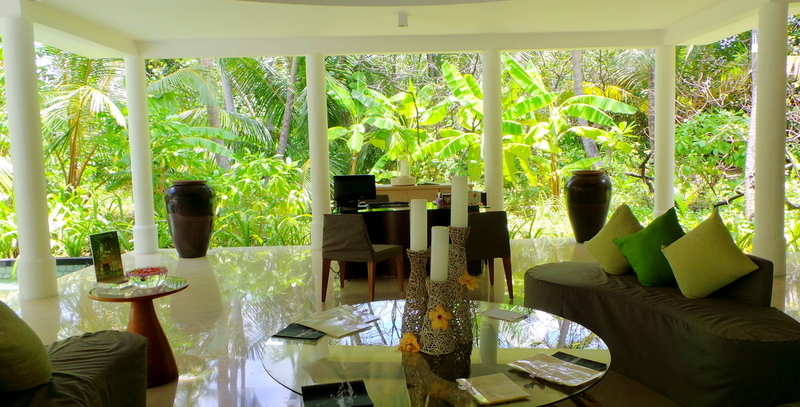 Evelyn, our personal villa host has been most accommodating in arranging our activities and itinerary. Nothing is too impossible for her and the reservations staff. This was specifically proven true when we had a little bit of a ‘situation’ the night before we checked out of NIYAMA. Zombie had gone scuba diving and needed at least 24 hours before flying to avoid decompression sickness. Now it sounds silly but all seaplane departures are only confirmed the night before the flight. 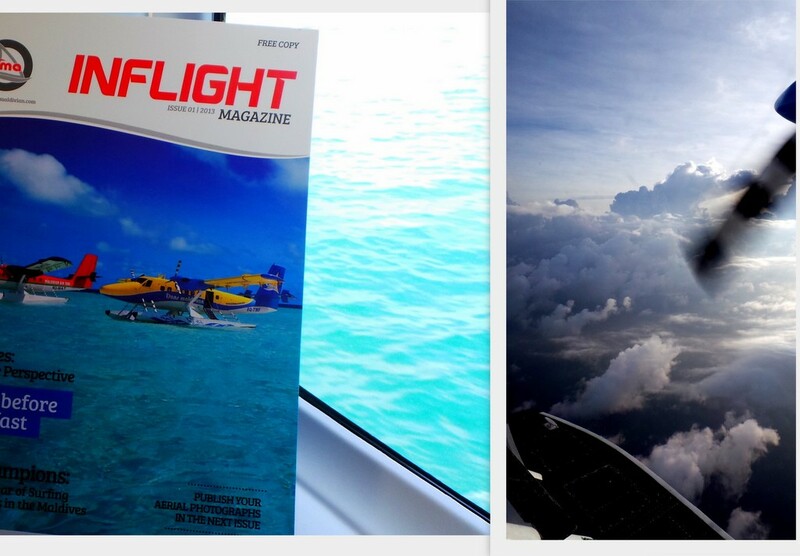 We found out that the seaplane company had us booked at 6AM the next day, well under the 24 hour time frame. Evelyn and the reservations team of NIYAMA liased and coordinated with the seaplane company in order to move our flight to a later time. Everyone from management level to the villa hosts and the wait staff– all are genuinely friendly in a sincere manner (not automated or resort-mode), and Zombie and I can tell that they actually really like being there doing their jobs. 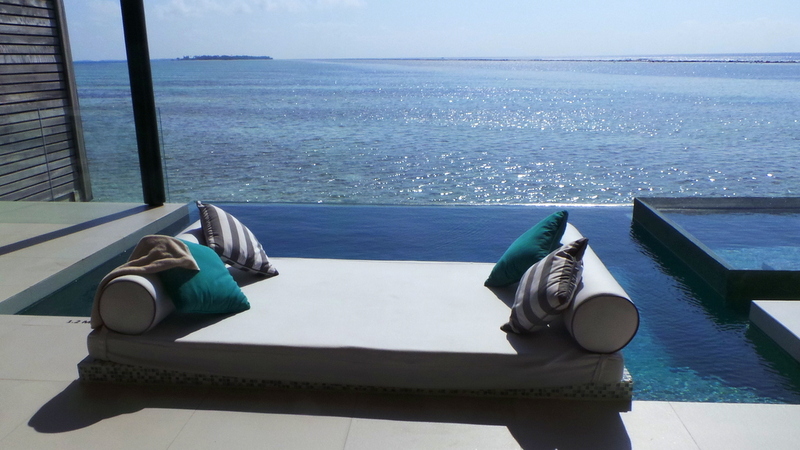 It’s evident, NIYAMA is luxe, modern and convenient. It’s perfect for those who like to travel far away but still want to have their city comforts, and more. The consistency of the brand is impressive – from the Airport lounge, the rooms, the resort grounds, food and the staff – they all carry and evoke the same theme. The rooms offer much more gadgets and entertainment than most urban sophisticated pads have, and it can be a daily struggle deciding how to spend your day: getting entertained inside, or jumping in the waters outside. Those who like to literally “get away from it all” and not be reminded of the modern life that they are getting away from may not be up for this lovely nature meets modernisation type of combination. As for me? That is just my kind of cocktail, and I’ll take it any time. Are YOU the modern kind of traveller? or are you the type to leave everything behind? We were guests of NIYAMA Maldives. There is no obligation to write a favourable review and this has not influenced my thoughts and views about the brand and property. All opinions of this blog post are my own. This hotel has it all! wow! My wife and I trying to decide btwn the Deluxe Water Stuidio with Pool and the regular Water Studio with Pool. As far as I can see, the main difference is the inclusion of a jacuzzi, right? I assume its slightly bigger as well but can’t tell if pools are same or not. We are going in December and not sure if its too warm to even use the jacuzzi at night. Did you get much use out of it or was the weather still hot at night for you? Not sure if its money worth saving towards spending on other things (like at spa, etc.) on the island. Please let me know if you have any info / suggestions! Thanks again! Great article! I love the underwater nightclub, I already seen the underwater restaurant of Conrad Maldives but this one looks amazing! Hi Francois! 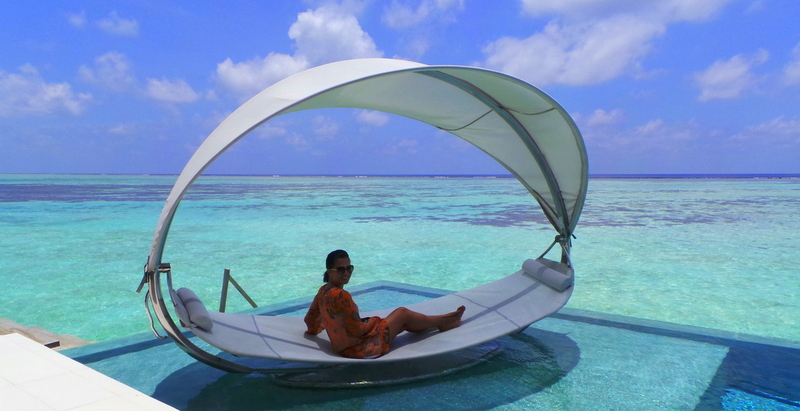 I’d love to see the underwater restaurant of the Conrad Maldives one day 🙂 The highlight for me in this Maldives trip was the underwater spa at Huvafen Fushi ! Strange. You review a tropical island hotel, in the Maldives at that, where the hotel is the whole island and in fact two whole islands joined by a bridge in this case, and yet you do not mention nor describe the environment, the beaches the lagoon, the reef. There’s a section, and even an entire video dedicated to diving at NIYAMA which shows much more than the reef. I guess you overlooked that. Strange. That sounds amazing! May I ask how much a trip like this would cost? Thank you for a very detailed review–this helps other travelers a lot! We’re planning on booking but wanted to know more about the deli-in experience–is it included in the payment of the room or is it like a standard minibar that you “pay for what you get from the fridge” situation? Hi Steph, when we were there, the mini bar items were included. They even refill it every night! shared this post on my facebook and mmy friends thought it was great. Keep up thee aweskme work.